Here’s a copy of the press release that went out over the wires yesterday. We’re being contacted from media across the country. Please feel free to forward it to any journalists you have contact with. 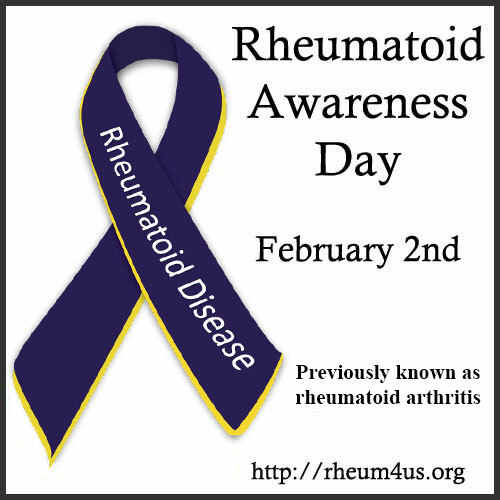 January 22, 2013 – Rheumatoid Patient Foundation (RPF) announces the establishment of Rheumatoid Awareness Day to be held each year on February 2, giving people with the chronic illness known as rheumatoid arthritis, or rheumatoid disease, a day of recognition. Because the disease is commonly presumed to be a type of arthritis, awareness is lacking, causing problems with disability accommodations, clinical care, healthcare reimbursement and research funding. Rheumatoid arthritis is a progressive inflammatory disease causing damage to joint and organ tissues, resulting in severe pain, frequent disability, and increased mortality. For most patients, current treatments neither relieve all symptoms nor assure a healthy future. Remission is rare. Rheumatoid disease affects about one percent of the world’s population, with 1.6 to 2 million Americans currently diagnosed. Mayo Clinic says lifetime risk of the disease is 3.6 percent for women and 1.7 percent for men. The Rheumatoid Patient Foundation will support the first annual Rheumatoid Awareness Day with a campaign aimed at raising awareness and educating about rheumatoid disease. RPF encourages both the rheumatoid patient community and the public to get involved by sharing educational resources, promoting awareness messages via social media, participating in a live online chat and a donation- matching opportunity. For information on how to support Rheumatoid Awareness Day, visit http://rheum4us.org/rheumatoid-arthritis-awareness-day/. RPF is a 501c(3) non-profit organization dedicated to improving the lives of people with rheumatoid diseases such as rheumatoid arthritis and juvenile arthritis. RPF was founded in 2011 to address significant lack of disease education, comparatively low levels of research funding, and difficulty obtaining adequate treatment. RPF is committed to creating pathways to better clinical care and disease outcomes through education, awareness, and participation in patient-centered research. For more information, visit http://rheum4us.org or follow us on Facebook or Twitter. If I had a client hospital who wanted to have their rheum docs find out EXACTLY what you want them to do, where would they start? Is there a “docs start here” page or post? Thanks, Kelly for mobilizing this effort! I agree with Dave! — Do you have a dedicated link for rheumatologists and related industries (pharma & labs) to connect with RPF? This is great! Kelly, you are wonderful. Kelly, Is it ok for me to reuse your awareness badge to raise awareness through FB? Thanks. Yes, if you follow the links in the press release there are pages set up for that on rheum4us.org, with several images you can have. Or feel free to take one from this site too. We’ve set up a Twibbon campaign for FB and Twitter images, Facebook cover images and lots more. Go to the rheum4us.org page linked in this press release. Here it is copied for you> For information on how to support Rheumatoid Awareness Day, visit http://rheum4us.org/rheumatoid-arthritis-awareness-day/. Kelly, you have done such an amazing thing. I have had RA for years but, have never found accurate and in-depth information until I found your site. Your efforts, while suffering from this disease, are extraordinary. Thank-you for giving a voice to RA patients. On the days when the pain and fatigue beat on you just think of all of us. We have had our lives improved and our pains lessened because of you. Thanks! Kelly…I cannot thank you enough for all that you have done and continue to do. This is something so monumentalo and so greatly needed to so many. I really, rally needed to see this and was beyond excited when I did. Thank you for the hope and for your boundless efforts. Hey our dear, strong, wonderful Warrior leader and sister. I just wanted to let you know that I am sending this link to our local paper here in Helena, MT. Much love and prayers, and gratitude, as always. Thanks so much for your voice and advocacy Kelly. I am glad to do my part to publicize this on my blog and social media to raise awareness one person at a time.